All adult women below gentry level appear to have worn some sort of hair covering. There are few illustrations of mid-17th century British coifs available; even fewer extant examples, most if not all of which are middling to high status. Most ‘common’ women’s coifs are only illustrated in woodcuts which can be crude but none the less useful. Figs. 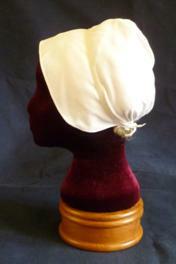 1 & 2 show ‘Elizabethan’ or ‘Jacobean’ type coifs, which may or may not have had a cross cloth beneath. Fig. 3 shows the cross cloth tied over the. coif. 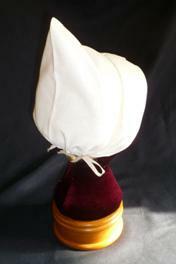 The ubiquitous ‘pointed’ coif is shown in Fig. 4. In Fig. 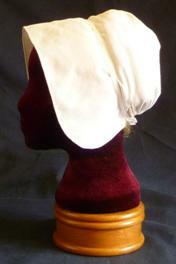 5 a head-wrap is worn. 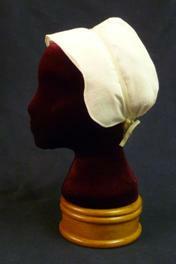 While common at the turn of the century head-wraps were old fashioned by the mid-17th century and may have only been worn by elderly women. In Fig. 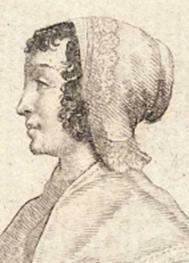 6 Hollar’s ‘Housemaid’ appears to be wearing a coif very similar to the one found at The Plough in Sittingbourne (Fig. 7), and to two coifs in the Platt Collection, Manchester Museum (Fig.8 & 9). Fig. A, in a detail from from ‘Hilleke-de-roy and Four of Her Orphans’ (Unknown artist, 1586) a child, in the process of having her hair dressed, holds the end of the ribbon/tape which has already been included in one braid, in preparation for braiding the second. Fig. B, a detail from ‘Market Scene’ (Joachim Beuckelaer, 1563) shows a ribbon/tape braided through the hair and tied at the top of the head fixing the hair in place. N.B. The model would not be wearing her earrings on a Living History display. This is a guide to one way ordinary women might have dressed their hair prior to covering it with a head-wrap or coif and cross cloth. It is suitable for shoulder length hair and longer. Hair that has not been washed for at least a day is best as freshly washed hair can be slippery and fly-away, although an application of beeswax is said to help in this case (rub a block of beeswax in your hands then stroke your hair with your waxy palms). This style is now known as ‘Milkmaid’ or ‘Heidi’ braids, but as Kirby grips and elastic pony-tail holders were not available in the 17th century tape or ribbon was plaited into the hair to hold it in place. The author has tried this style and found it very comfortable! You will require two equal lengths of tape or ribbon, 4 to 5 times the circumference of your head depending on the length of your hair, and some hair pins. Cat is optional. Brush your hair and part exactly down the middle into two halves, left and right. Place the tapes behind your neck and over your shoulders, equal lengths on each side (Fig. 1). Anchoring the tapes for the opposite side in your mouth, split one half of the hair into three equal amounts, including the the tapes in two of the portions (Fig. 2). Taking the front portion back first, begin to plait the hair behind the ear incorporating the tapes (Fig. 3). Continue to plait firmly, including tapes (Fig. 4), until you reach the end (Fig. 5). Secure the end of the plait by wrapping the tapes around and tying a single knot (Fig. 6). Take the plaits up over the head, crossing them at the top (Fig. 10). Bring them down in front of the opposite plait and around the back of the head (Fig. 11). 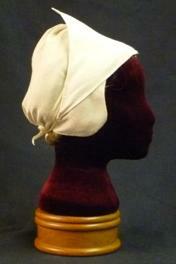 Bring the tapes in front of the plaits and back up to top of the head and tie with a bow (Fig. 12). This should be snug and not too tight. If tied snugly enough the whole arrangement is anchored by the base of the plaits (Fig. 13). Tuck any loose hair under the tapes (there will be a certain amount if you only have shoulder length hair) and fix with hairpins if required (Fig. 14). The tapes sit neatly under the base of the skull (Fig. 15). 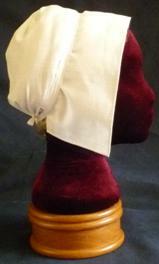 Rear view showing plaits crossing at the top of the head (Fig. 16), side view (Fig. 17), neat and tidy and ready for a coif or head wrap (Fig. 18). 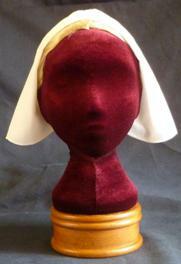 Place the long edge of the cross cloth along the hair line of the forehead, tie behind the head (Fig. 1). 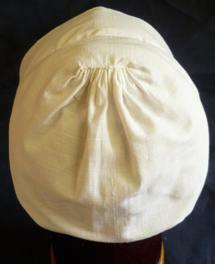 Place the coif over the head and cross cloth, pull up the drawstrings at the back. Cross the drawstrings under the coif, bring them up in front of the hair braids underneath, cross them over at the top, bringing them around and under the coif again. Tie firmly with a bow (Figs. 2 & 3). The ties and therefore the coif are held firmly in place by the braids underneath. 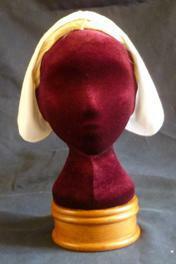 Your hair should now be completely covered, and there is no fear of your coif falling off (Fig. 4). Many woodcuts show ‘pointed’ coifs, these appear to be simply coifs that are have not been gathered at the back. They are shown at their best when worn, and tied, over braided hair (Figs. 5 & 6). Now-a-days we usually have much shorter hair. 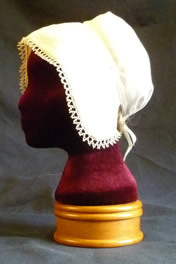 So how do we get the same look to our headdress as our 17th century fore-mothers? We fake it of course. 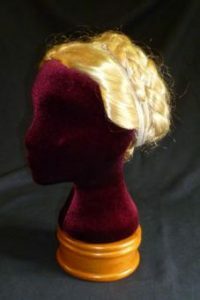 To obtain the same shape to a coif as braided hair a false braid is necessary. This is not without precedent as Fig. 1 shows. This is a false braid found along with other items as infill between the floors of a town house in Kempten, Germany and is now in the Allgäuer Landesmuseum. It is dated to the 15th/16th century. Modern false braids may be as simple as adding a wool plait to a plastic Alice Band. 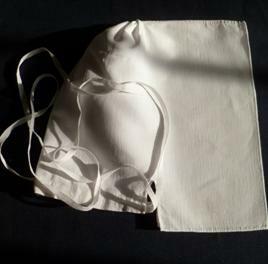 Instructions for how to make and wear them to follow when photographs are taken – watch this space! Don’t want to fake it? Make your coif slightly less deep front to back. Pin your hair up and back from the hairline with hair-grips, tie on a cross cloth snugly then put on and pin your coif to your cross cloth (see ‘Fixing a cross-cloth and coif’ Figs 1 & 2 above). 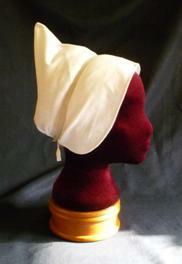 It will not have exactly the right shape, or be quite as firmly fixed, but it should stay on all day. Make sure no more than a few wisps of hair escape. 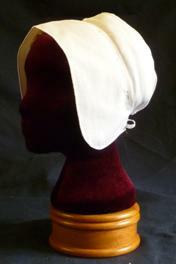 The following patterns result in at least 10 different varieties of coif possibly worn by ordinary, low status, working women in the mid-17th century, and a simple triangular cross cloth. 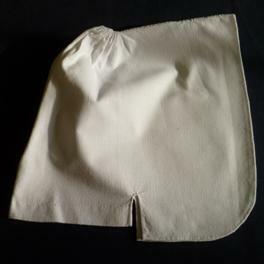 The patterns include 1cm (3/8”) seam and hem allowance. 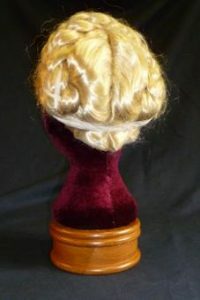 Every head is unique with varying amounts of hair to cover, so coifs were, and are, made to fit individually. 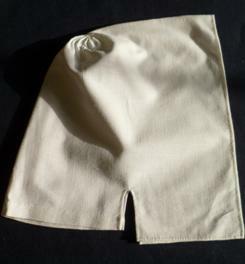 If the size given in the patterns below does not fit, adjust them to fit by lengthening, shortening, or deepening them. It is recommended you make one up in a cheap fabric, then adjust to the size that fits you. 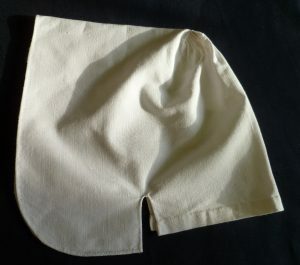 From a scrap piece of linen fabric cut an exact square between 28cm (11.5”) and 23cm (9”), depending on fabric available, and the desired size. 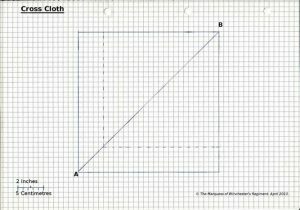 Cut diagonally from A to B, this gives two cross cloths. 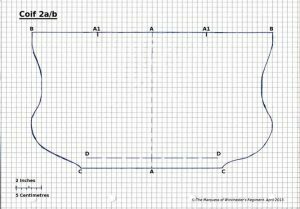 Attach tapes or ties at corners A and B. As above but with the point gathered into the crown. 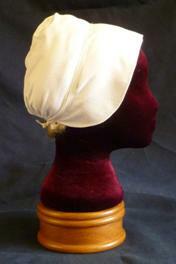 Based on a coif in Chelmsford Museum and the Sittingbourne coif (Introduction Fig.7). Slightly more complicated construction. Based on the coif in the Platt Collection, Manchester Museum (Introduction Fig. 8). May be varied by rounding off the front corners and/or turning back the front edge. 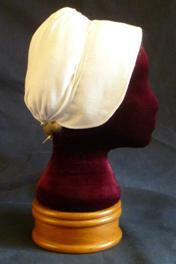 Based on a coif in the Platt Collection, Manchester Museum (Introduction Fig. 9). 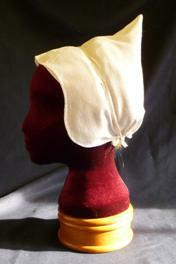 Please note the seam is at the back of the coif, unlike previous examples where it is at the top. 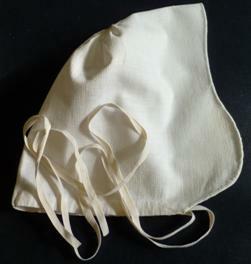 Again it may be varied by rounding off the front corners and/or turning back the front edge. All the coifs illustrated may have narrow lace added for ‘Sunday Best’. 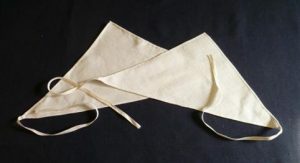 Using a stiff mid-weight linen (a lighter linen could be used if the finished article is well starched), cut out along the solid line. 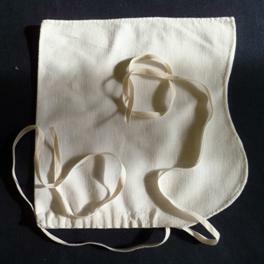 Fold in half along the centre back line A to A.
Seam (run and fell) from B to A.
Hem from C to B to C.
To make the drawstring casing, turn up D to D onto the wrong side, turning under the raw edge C to C. Hem down. Run a cord or narrow tape at least 2.5 times the circumference of your head through the casing. Using a mid-weight linen, cut out along the solid line. 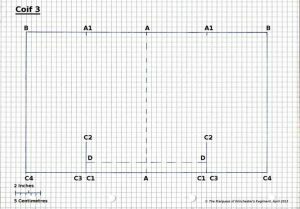 Seam (run and fell) from B to A1. 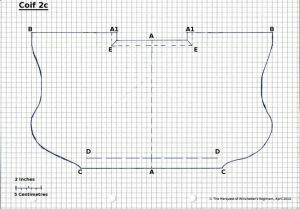 Turn down raw edge into the inside of the coif and run a gathering stitch from A1 to A1. Pull up the gathers and anchor well. Follow stages 1 to 4 for Coif 1b and 2b above. Fold under the raw edge E to A1 to E.
Fold under the raw edge E to E, run a gathering stitch along the edge. 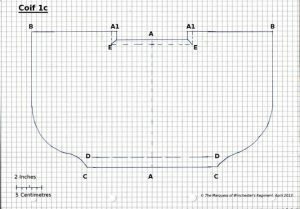 Pull up thread and whip-stitch the gathers to the edge E-A1-E.
Continue stages 6 and 7 for Coif 1b and 2b above. 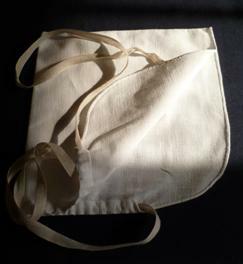 Using a light to mid-weight linen, cut out along solid line (rounding front corners if desired). Fold in half along centre back A to A. 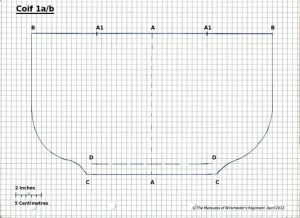 Make a run and fell seam from B to A1. If not already done, cut the slits C1 to C2. Starting at C1 make a narrow hem to C2, back down the opposite side to C3 along to bottom edge to C4 up the front edge to A and then carry on down the other side in reverse order until you reach C1. 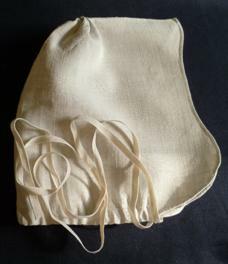 To make the drawstring casing, turn up D to D onto the wrong side, turning under the raw edge C1 to C1. Hem down. 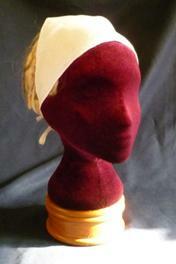 Coif 4 is different from the rest as the seam runs up along the centre back not along the top of the coif. Using a light to mid-weight linen, cut out along the solid line (rounding front corners if desired). Fold in half along the top A to A. Make a run and fell seam B to A1. Fold under the raw edge E to A to E.
Fold under the raw edge E to A1 to E, run a gathering stitch along the edge. 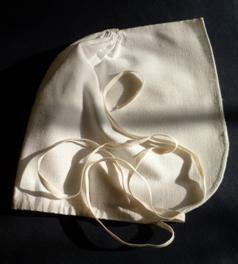 Pull up thread and whip-stitch the gathers to the edge E-A-E.
A head wrap is simply a yard square of light to middling weight linen fabric hemmed all round and folded in half diagonally to form a triangle (Introduction Fig. 5). 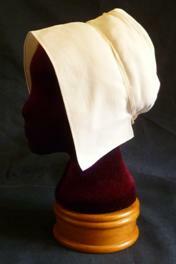 (To follow when photographs are taken, meanwhile see The Tudor Tailor). Fig. 1, Detail from ‘A Statute for Swearers and Drunkards’ 1624. http://thegoodwyfe.blogspot.co.uk/2011/02/knitted-caps-or-hats.html , retrieved 11-04-2013. Fig. 2, Detail from ‘A Pretious Treasury’, 1649. http://the1642goodwyfe.wordpress.com/2012/11/16/a-pretious-treasury/, retrieved 11-04-2013. Fig. 3, Detail from ‘The Witch of the Woodlands, or The Cobbler’s New Translation’, 1655. http://the1642goodwyfe.wordpress.com/?s=Translation, retrieved 11-04-2013. Fig. 4, Detail from ‘Stripping, Whipping and Pumping Pamphlet’. 1638. http://the1642goodwyfe.wordpress.com/?s=stripping, retrieved 11-04-2013. Fig. 5, Detail from ‘The Discovery of Witches’, 1647. http://the1642goodwyfe.wordpress.com/?s=Matthew+Hopkins, retrieved 11-04-2013. Fig. 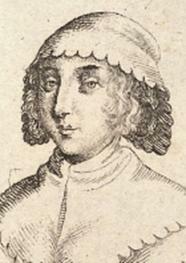 6, Detail from ‘ The kitchen-maid’ Wenceslas Hollar 1640. http://commons.wikimedia.org/wiki/File:Wenceslas_Hollar_-_The_kitchen-maid_%28State_1%29.jpg, retrieved 11-04-2013. Fig. 7, Coif found under floorboards during the demolition of the Plough Inn in Sittingbourne. http://www.hrgs.co.uk/concealed-artefacts/70-the-plough-finds, retrieved 11-04-2013. Fig. 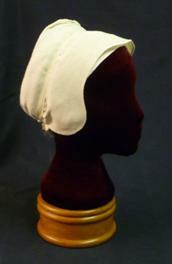 8, Linen coif with needlepoint lace insertions and edges, 1640-1660. Platt Hall, Manchester. © Manchester City Galleries. http://www.manchestergalleries.org/the-collections/search-the-collection/display.php?EMUSESSID=70a1d15972b6f1d280a79741cbfedd50&irn=14952, retrieved 11-04-2013. Fig. 9. 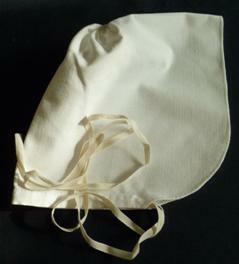 Linen coif, cut in one section, folded over crown and joined at back by openwork seam of needlepoint lace. 1625-1650 . Platt Hall, Manchester. © Manchester City Galleries. http://www.manchestergalleries.org/the-collections/search-the-collection/display.php?EMUSESSID=70a1d15972b6f1d280a79741cbfedd50&irn=14567, retrieved 13-04-2013. Fig. 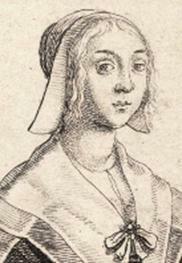 A, Detail from ‘Hilleke de Roy and Four of Her Orphans’ 1586. http://www.pubhist.com/work/10226/anonymous/hilleke-de-roy-and-four-of-her-orphans , retrieved 11-04-2013. Fig. B, Detail from ‘Joachim Beuckelaer – Market Scene‘ 1563. http://commons.wikimedia.org/wiki/File:Joachim_Beuckelaer_-_Market_Scene_-_WGA02118.jpg, retrieved 11-04-2013. Photographs, Braiding Hair, 16th and 17th Century Style. 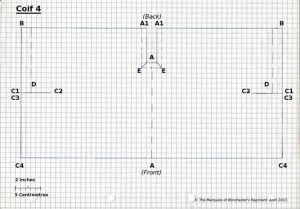 Instructions for braiding hair & Fixing a cross-cloth and coif. © S. I. Sampson and E.E. Sampson. 2017.